It is the mission of Dahle Orchards, The Farmer in The Dalles, to grow, distribute and specialize in the production of high quality fruit using the most currrent and innovative techniques and resources; ensuring freshness, taste and superior overall quality. Dahle Orchards was established in 1984 by Timothy Dahle. The operation is a family farm consisting of 380 acres of mostly high density, pedestrian orchards. Our focus is on fruit quality, food safety, worker safety, and sustainability. The "pedestrian" system allows us to pick fruit without ladders, increasing worker safety and efficiency. Tucked in the shadow of Mount Hood, on hillsides overlooking the Columbia River, grow some of the finest sweet cherries in the world. The mountain blocks most of the rain that blows in from the west, protecting the cherries from weather that would otherwise split and soften the fruit. Although there have been cherry orchards here in The Dalles for generations, the industry has changed, and so have the cherries. Northwest sweet cherry production is trending upward. Growing sweet cherries for the fresh market demands a strategic understanding of international trade, consumer preferences, and state-of-the-art horticulture in addition to a sweet place on the sunny side of the mountain. 'Benton' is an excellent variety competing with 'Bing' for shelf space. Argued by many to have better flavor than 'Bing' and eqully firm. 'Bing' is the go to variety in the United States if not the world. 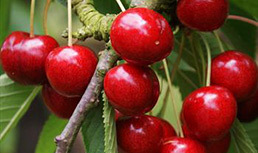 It is the number one cherry grown in the US. 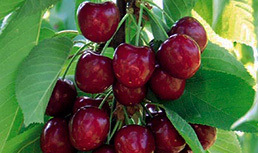 'Chelan' is our first cherry we harvest in The Dalles. It has good taste and firm flesh. 'Chelan' a good early season cherry. 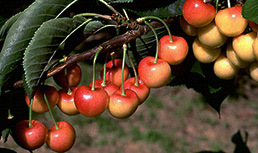 'Rainier' is the most commonly thought of cherry when it come to blush cherries with great taste and color. 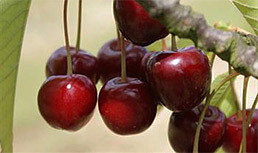 A great cherry for consumers and growers alike. 'Regina' ships very well and maintains great quality. 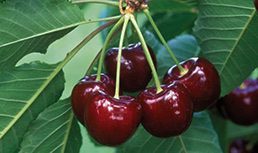 'Sweetheart' is our latest ripening variety of cherry. It has light mahogany skin color and excellent, strong flavor. Dahle Orchards was established in 1984 by Timothy Dahle. The operation is a family farm consisting of 380 acres of mostly high density, pedestrian orchards. Our focus is on fruit quality, food safety, worker safety, and sustainability. Sweet cherries have several cancer-preventive components including fiber, vitamin C, carotenoids and anthocyanins. 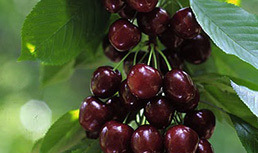 The potential role of sweet cherries in cancer prevention lies mostly in the anthocyanin content, especially in cyanidin. Sweet cherries are a good source of cyanidins, which appear to act as an antioxidant and in this role may reduce cancer risk. In a study by Acquaviva et al, a significant increase in free radical scavenging was demonstrated with exposure to cyanidin (Acquaviva, 2003) and a separate study using human cancer cell lines demonstrated cell cycle arrest and apoptosis of mutated cells exposed to cherry anthocyanins (Lazze, 2004; Shih, 2005). Further research suggests that the growth arrest characteristics of cyanidin are likely, at least in part, to be a result of significant inhibitory effects of these cherry components on epidermal growth factor receptors (Meirers, 2001). Finally, there is compelling evidence from basic science that cyanidin may also promote cellular differentiation and thus reduce the risk for healthy cells to transform to cancer.